Consider Michael Glennon, Tufts University Fletcher School, and author of Double Government, on the intellectual ability of the American public. Turns out the American public mind is one giant mass of Silly Putty! “…the economic and educational realities remain stark [in the USA]. Nearly fifty million Americans—more than 16% of the population and almost 20% of American children—live in poverty. A 2009 federal study estimated that thirty-two million American adults, about one in seven, are unable to read anything more challenging than a children’s picture book and are unable to understand the side effects of medication listed on a pill bottle. 59% could not name the Speaker of the House; and 63% did not know how many justices are on the Supreme Court. 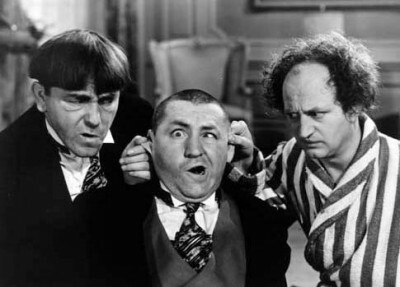 Far more Americans can name the Three Stooges than any member of the Supreme Court. Other polls have found that 71% of Americans believe that Iran already has nuclear weapons and that 33% believed in 2007 that Saddam Hussein was personally involved in the 9/11 attacks. In 2006, at the height of U.S. military involvement in the region, 88% of American 18- to 24- year-olds could not find Afghanistan on a map of Asia, and 63% could not find Iraq or Saudi Arabia on a map of the Middle East. Three quarters could not find Iran or Israel, and 70% could not find North Korea. The ‘over-vote’ ballots of several thousand voters—greater in number than the margin of difference between George W. Bush and Al Gore—were rejected in Florida in the 2000 presidential election because voters did not understand that they could vote for only one candidate. There is, accordingly, little need for purposeful deception to induce generalized deference…in contemporary America…President Harry Truman’s Secretary of State Dean Acheson, not renowned for bluntness, let slip his own similar assessment of America’s electorate. “People don’t see clearly unless they want to. Nowadays everyone quietly accepts the inevitable.